Unless otherwise noted, all workshops meet in Susanne's Warwick home. Eating healthy, and possibly even organic, can be within reach if you change how and where you shop, how you prepare and use your food. A lifelong from-scratch cook and passionate foodie who grew up in Paris and Brussels, Susanne will cover shopping, storage, preparation and cooking methods to make healthy eating affordable. Breakfast sets the tone for the day and needs to be a nutritious and healthy meal that takes you all the way to lunch, and it doesn’t need to be freezer waffles. Healthy snacks don’t have to come out of a bag. Together we will explore quick, fresh and healthy alternatives to the same old same old. Handouts, demo and refreshments included. quick, healthy and delicious weeknight meals. She will share her tips, strategies and techniques so you and your family can eat healthier. The many choices, terms, and labels can make food shopping overwhelming. For these two workshops we will meet at the Warwick Shoprite to identify and understand the many options you are confronted with. From navigating a supermarket, to the different egg choices, organic, conventional and GMO produce and the labeling that comes with it, to meat and dairy options, seafood, and where else you can shop besides the supermarket, we will cover all the basics so you can make informed decisions and feel in control of your grocery choices. Note: Future workshops may meet at other supermarkets in the Hudson Valley. Meanwhile, I am also happy to offer private sessions for a group of friends, at your convenience and at a supermarket of your choice anywhere in the HV for $250, 2-week notice and prepayment required. Please email me if interested. A Deep Living gift certificate can be redeemed for books, workshops, and retreats. We are happy to mail a beautiful gift certificate to the recipient. Please contact Susanne for logistics or to redeem. A glimpse of the Good Life, the way life was meant to be, and a deeper awareness of joy, presence, and meaning. Take half a day off to revitalize your mind, energize your soul, indulge your senses, and remember what truly matters. If you come from a bit further consider spending the rest of the day exploring Warwick, which Chronogram Magazine has called "one of the most perfectly realized blends of urban and rural cultural wealth in the entire Hudson Valley, if not the world." 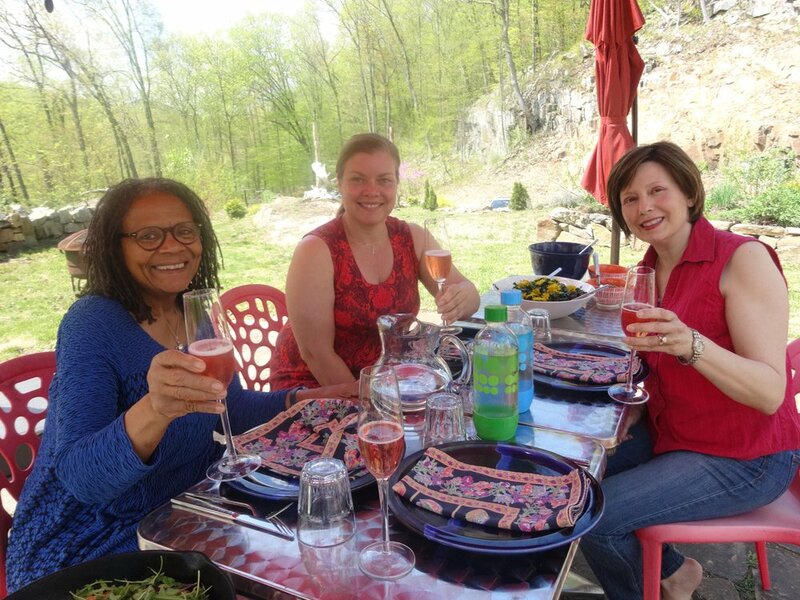 These private and intimate half-day retreats in mid-week are held in my serene, net-zero home in picturesque Warwick, NY. Each special retreat is limited to just three participants to allow for true connection. Together we will enjoy delicious, homemade treats, lunch or refreshments, and reconnect with life in a deep way. Deep Living Retreats also include a signed copy of my multi-award winning book, Deep Living: Healing Yourself To Heal The Planet. Ahhhh, so easy. Together we will make sense of the complex food conversation around diet, organics, shopping, cooking, and eating. Then we will find pleasure and meaning in transforming delicious organic ingredients into a memorable meal, and indulge in a special lunch in great company with good conversation. Bon appétit! When I had children I became concerned about the quality of our food, and aware of how important healthy soil is to our health. Much of my food comes directly from the local sustainable farmers that I know and can trust. Join me on a restorative adventure to discover the tenets of slow food. We will visit a local sustainable farm to see where our food comes from and experience the joy and meaning of creating a direct relationship with the farmer. During a tranquil picnic on the farm grounds, we will continue our conversation on the deliciousness of healthy soil. As a teenager I wanted to become a doctor. While that did not happen, my early spiritual search eventually led me to graduate research on understanding the healing process, and a shift in grasping its complexity. Let the stress melt away as you gain a new understanding of the healing process through several experiential practices while we share delicious superfoods and superdrinks. You will feel empowered as you discover healing as a multifaceted mind-body-spirit approach that is entirely unique to you. Individual half day retreats are offered at $249; or $649 when you register for all three. Please contact me about private and custom-tailored, individual or small-group retreats to suit your schedule and needs. Perhaps you would enjoy quality time off together with a few close friends. Cancellation policy: Things happen, I know. In case something comes up unexpectedly you might find a friend or relative to take your place. Otherwise, I offer a 50% refund if cancelled more than seven days before the retreat or workshop date.